It’s almost time for one of mid-winter’s biggest celebrations. No, not Valentine’s Day. We’re talking about the football game of the year happening on February 1st! Sure it’s great to go out to a bar or restaurant to cheer on your team, but it can be even more fun to throw your own party. With a little bit of planning, your friends will have an awesome time and you’ll be the MVP of the day. Aside from a TV, food and drinks are the foundation of a successful big game party. Since these types of parties are typically casual, your menu can be as well. While it can be tempting to cater food, you can keep costs down by making your own appetizers, dishes, and desserts. It’s not as difficult or as time consuming as you might think. To get started, take a look at these simple and delicious party food ideas that will keep your guests full and happy all game long. The Nacho Bar – Serve tortilla chips and a selection of toppings in separate bowls so that everyone can choose exactly what they want. Salsa, sour cream, jalapeno slices, guacamole, spinach dip, and cooked and seasoned ground beef are just a few options. Be creative! Football Cheese Plate – No cooking required for this eye-catching appetizer! Just slice up some cheese and pepperoni and assemble on a serving tray with crackers to look like a football. Baked Buffalo Wings – Forget frozen or restaurant-bought buffalo wings. Make them yourself and save money while impressing your guests. Here’s an easy recipe that will give everyone a spicy kick while they watch the kickoff. Pizza Rolls – These hearty rolls are deceivingly simple to make with refrigerated pizza dough, mozzarella cheese, tomato sauce, and your favorite pizza toppings. Mexican Pinwheels – Spread cream cheese mixed with chopped onions, green chiles, and black olives on a tortilla, then roll it, chill, and slice. This tasty appetizer takes just minutes to prepare and can be made the day before your party. BLT Bowl – Add some healthy greens to your menu. This BLT without the bread is a hearty salad that even your non-salad eaters will love. Sloppy Joe Sliders – These mouthwatering sliders are a flavorful choice for a main dish or appetizer. Brown some ground beef with onions and garlic, add in peppers, ketchup, mustard, and some water, and serve on rolls. Baked Ziti – This incredibly cheesy baked ziti is is an easy and hearty game day food idea. It is made with just six ingredients and takes only about a half hour to make. Bake the dish ahead of time and then reheat in the oven or microwave. Serve with Italian bread on the side. Football Cookies – Sweeten up your serving table sidelines with football cookies. There’s no need to make your own cookie batter – these are made using refrigerated sugar cookie dough, chocolate frosting, and white decorating gel. 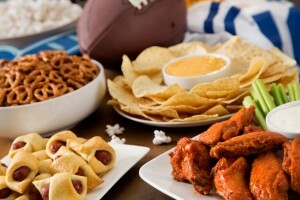 Snack Stadium – For the ultimate football-themed appetizer, create a snack stadium. Made with crescent roll dough, salami, veggies, chips, and more, this “snackadium” is an amazing edible centerpiece and is a sure to score a tasty touchdown at your football bash. Friends, food, drinks, and football – it doesn’t get more fun than that. Have a great game day!